I cannot emphasize enough the value of volunteers in aged care. To support and nurture them is of the utmost importance. Here is a sample of a handbook I've been using. I am wanting to start up a volunteer program at our community based aged care organisation. I am looking for people opinions on how to go about advertising this? Do you ask you volunteers to commit to a specific day? Any suggestions would be greatly appreciated! Hi Jan, what a great bunch of volunteer have you got! How clever of you to gather so interesting people around.Well done! I have read your Volunteers Handbook and think it is great. I have set up a Volunteer hand book at our facility and would like to suggest you include a Confidentality Aggreement that is signed by the Volunteer and witnessed and is kept on file with the Police Check document. I also included a copy of Residents Rights for the Volunteers to read and keep. It's really wonderful to see our clients so engaged with the puzzles and word searches, the Trivia is really popular and our participants get a buzz out of getting the answers correct. 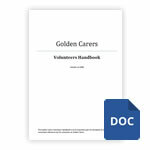 Golden Carers is our "Go To" resource on a weekly basis and it is rewarding for our working day to add it to our activity programs. I love this site so much! Thanks for all your great ideas.